An online safeguarding training course written specifically for anyone who works or volunteers within the equestrian world. Developed in association with the British Equestrian Federation this course gives an introduction to child and adult protection procedures, including legislation, signs and indicators of abuse and how to report concerns. I really liked the short tests at the end of the modules as they were a good indicator of how much information I had retained and digested correctly. It made the course quite interactive. I also found all the links to documents and websites, as well as the downloads, very useful. Thank you very much. The Equestrian Basic Awareness online training course can be taken by anyone involved in the equestrian sector as an alternative to face-to-face training at the introductory level. However, if you are working as a professional in the equestrian sector then one of our Equestrian Advanced Safeguarding courses may be more appropriate for you. Does this course include training on safeguarding adults? 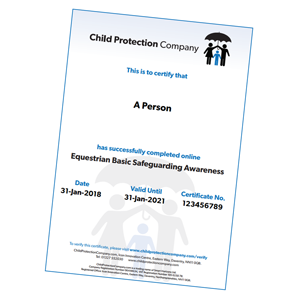 Yes, the Equestrian Basic Awareness training is a combined course covering both child safeguarding and safeguarding adults at risk. The purpose of this first module is to help you to assess your current knowledge of safeguarding. You will look at a series of scenarios set in an equestrian environment, which will start you thinking about some of the ways in which you could encounter potential abuse and what actions you might take in response. Sadly, abuse and neglect do happen in sometimes surprisingly large numbers. Often, children and adults at risk will find it hard to speak to someone about the abuse they are suffering, or they may have very few people who will listen. The stables may be the safe haven they need to encourage them to open up to someone about their situation. This module will look at what child protection and safeguarding adults actually means, preparing you should you find an individual discloses something to you, or if you suspect there is a problem. On completion of the module, you will have a much better understanding of keywords and phrases and how they relate to safeguarding and protecting children and adults. Safeguarding and protecting children, young people and adults at risk must operate within a framework of guidance and legal procedure. This module offers an overview of the framework of protection and how it is applied, and takes into account guidance from the British Equestrian Federation on your duty of care. Of course, you will not be expected to be able to quote detailed laws directly, but you will gain a general understanding of what they are. This module will also look at the organisations that may be part of safeguarding, their responsibilities and the guidelines for protection. By the end of the module, you will have a much clearer understanding of safeguarding guidance, the associated agencies and the legalities of protection. The module also looks at the safeguarding roles within the Equestrian setting so that you are familiar with the different roles both locally and nationally. To effectively detect, reduce and hopefully prevent abuse, we need to strictly define what it is and how it manifests itself. Understanding the categories of abuse will help you to recognise the tell-tale signs that it is taking place. At the end of this module, you will have a better understanding of what we mean by abuse and what the specific areas of abuse are, and how to spot them. People, regardless of age, often find it very difficult to talk about the abuse they are experiencing. The anxiety that they feel may manifest in different ways, such as displays of challenging or changed behaviours, and we need to be able to recognise these signs of abuse. Abusers are often adept at covering their tracks and may appear to be very caring people, so recognising the signs of abuse can often be the first alert to a situation. The learning you complete in this module will include example scenarios in realistic and equestrian situations, so that you can see how a person-centred focus can be achieved.